Being one of the largest populations in the world, India is home to 1.3 billion people, where two-thirds of the total population resides in rural areas. For this large population, the country has around 10 lakhs doctors as per the information shared by Medical Council of India. Of these, a recent KPMG report says, there are only about 2.63 lakhs doctors catering to the majority of Indians residing on the fringes of urban settlements and in rural areas. Though there is abundance of medical practitioners in metropolitan cities, the need for expertise in various tier II and III cities was overlooked mostly. Acknowledging this gap in Indian healthcare sector, Healthcare 360 Degree, a smart healthcare solution provider started their operations in 2017 with the intention to provide innovative marketing , Smart Hospital Concept and 360 degree solution to every strata of hospital. solutions, healthcare finance solutions and a handful of experts, we strive to deliver the best services and most innovative solutions to our customers in healthcare business. Through our continuous endeavours to deliver excellent services and solutions, we are able to meet our clients’ objectives and ensure value based care.” Healthcare 360 Degree’s service spectrum spans across assistance in hospital due diligence ,bank report, hospital architecture ,planning &construction, accreditations(JCI, NABH, NABL, NHSRC & QCI), healthcare training, marketing and operations outsource,merger & acquisitions, healthcare funding, healthcare unsecured funding and healthcare events and summits . Our prime objective is to meet all healthcare and hospital needs under one roof. 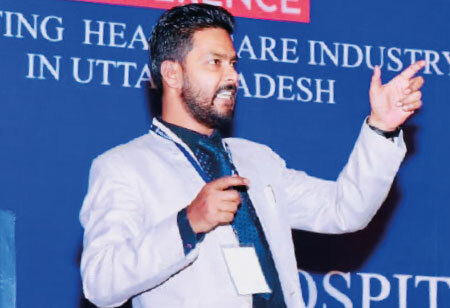 With 108 years of accumulatedhealthcare experience, team Health care 360 Degree has already proved their expertise to achieve maximum ROI for healthcare projects, lead Artificial Intelligence scale testing and Blockchain technology, carry out hassle free hospital mergers & acquisitions, design green and smart hospitals and certifying accreditations. The firm works on evidence based practice and believes in maximizing ROI. Their unique approach integrates research and clinical proficiencies and attempts to participate in all possible learning and development activities to strengthen our service delivery as far as it can. Healthcare 360 Degree’s focused and strategically executed efforts have helped them to grow substantially. It is evident from their progression from three employees to 12 employees, their capability to get NABH and JCI accreditations for clients within Four to Five months, their expansion to cities like Ranchi and Patna and more importantly from the increasing number of satisfied customers. “Our client size has increased to 40 within one year. Over these months, we have served different verticals in the industry such as quality & accreditation, healthcare operations and management, healthcare market positioning projects and healthcare outstanding clearance projects for many reputed clients, Yathrath Hospital Delhi, MJ Hospital Bharatpur and Udyan Hospital Patna, to name a few. Currently, our team is working on areas like Bloackchain in healthcare and hospitals, AI with proven R&D and tele medicine with focus on ROI. Inthe future, Healthcare 360 Degree as a consultancy firm wishes to expand to minimum five more states in India within one year, in crease customer base by 30 percent by adding medical colleges and other government hospitals and receive accreditation from NABET. We aim to be the most preferred firm as NABET’s consultants list and will continue to provide expert guidance in building cost effective smart and green hospitals,” Leslie summarized.